Alright – so this might be another post written out of a teeny tiny bit of frustration (see my last post on Open Rates). Here’s the deal – there is another totally misunderstood term when it come to email marketing: email deliverability. The biggest reason why there’s confusion is because there IS NO SET DEFINITION for it. Different people mean different things when they talk about email deliverability. This post aims to clear all that up (mainly because I’m getting tired of explaining it…). There are 2 commonly used definitions for email deliverability: the one that an email service provider (Infusionsoft, MailChimp, Constant Contact, etc.) uses and the one that the user of the email service provider uses (that means you). In order to understand the difference between the 2 different definitions, you need to understand how email works. I put together this diagram a while back. It outlines the process each and every email goes thru – no matter how you’re sending it. 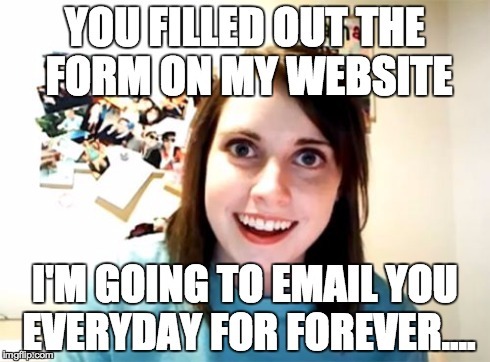 It works the same whether it’s coming out of Gmail or Infusionsoft. It’s just how it works. 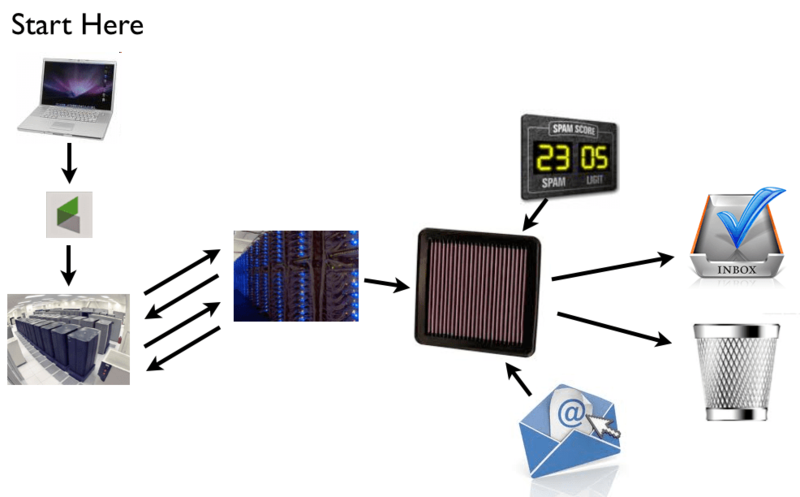 Now that the recipient’s mail server has the email (we’re at the black and blue image now – or is it white and gold), they pass the email thru 2 different filters – one called the SPAM filter, the other I call the engagement filter. The Engagement Filter is looking at the past history of the sender – in this case it’s Jordan. What this filter is looking for is whether or not the emails that Jordan sends to Monique get opened, clicked, forwarded or replied to. If they haven’t, it’s a one way ticket to the Junk Folder – otherwise it goes to the inbox. Note – this is 100% based on the reputation of the sender not the reputation of the email sending service. So let’s say you make it to the inbox (BTW – according to the data I saw this morning from ReturnPath ~80% inbox placement is average), if your recipient is using a desktop mail client or Exchange or something else like that – there’s another SPAM filter your message has to get thru in order to actually get to the recipients inbox. This is especially true with people that host their email with services like GoDaddy. Outlook downloads the messages from GoDaddy’s email server, then runs them thru another SPAM filter just to be sure. Alright, so now you’re an expert in the email process. What does this have to do with anything? Now I can explain the 2 different definitions that people use for “Email Deliverability”. Email service providers define email deliverability as an email where they get the message back from the recipient’s server saying they’ve got it from here (Step 4.5 above). The reasoning for this is that once it gets into the hands of the recipient’s server getting into the inbox is 100% based on the content of the email and the history of the sender. BTW – Infusionsoft’s deliverability rates based on this definition live in the 99%+ range. I haven’t seen them dip below that in a long time. That’s world class deliverability folks. Users on the other hand don’t care whether or not the email was accepted by the recipient’s server, they care whether or not it got to the inbox. That’s their definition. The problem with that is, they forget/don’t know that they play a huge part in getting their email to the inbox. It doesn’t matter what Infusionsoft does – if you send emails about overseas Viagra pills – you’re not getting to the inbox. Similarly, if you’re using an AOL Email address as your from address – you’re not getting to the inbox (and you need to be hit on the head with a tack hammer). So, what can you do to improve your inbox placement? So true. Everyone uses the same terminology to discuss 2 extremely different aspects of email delivery. Best post yet. Keep it coming. Great post Jordan, this is always a challenge to explain to my clients. We’ve had some amazing successby routing the email from Infusionsoft’s email servers using Adrian Savage’s http://www.wedeliveremail.info/ (not an affiliate link) through Mailchimp’s Mandrill service. One client had NO inbox deliverability due to her clients being almost completely on Exchange servers, this solution got her email delivered again. The second client I put on it had a ~~25% open rate, which had sagged to ~~13% due to inbox deliverability issues with Cox.net which is a huge presence in our region. His open rate is soaring up to 46% after switching. Can’t say enough good thing things about Adrian’s service and the measurable impact it’s had on those two clients’ business almost *immediately*.